1,946 pages | 239 B/W Illus. Urban Ecology is a rapidly developing area of research and study. Drawing on the work of many disciplines—including geography, planning, landscape architecture, sociology, economics, anthropology, engineering, and climatology—urban ecologists argue that an understanding of the relationships between living organisms and their urban environment as an integrated social-ecological system is an essential component of the decision-making and planning needed to create viable—and sustainable—cities around the world. 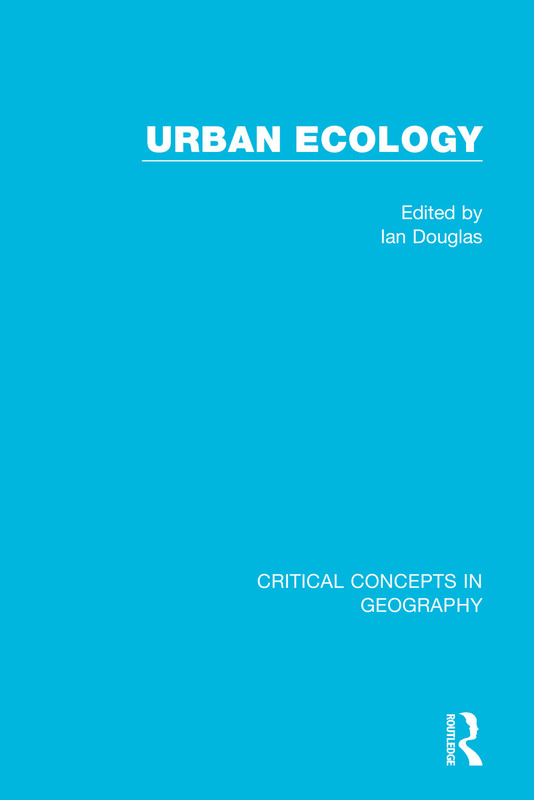 Now, Ian Douglas, one of Urban Ecology’s founding fathers (and editor of Routledge’s Handbook of Urban Ecology (2010), has brought together in four volumes the canonical and the very best cutting-edge research. The collection enables users readily to comprehend the philosophies, theories, and history of Urban Ecology, and make sense of the biophysical character of the urban environment, and the diverse habitats found within it. Urban Ecology also assembles essential works exploring how science can be put into practice to generate significant health, economic, and environmental benefits. With a full index, together with a comprehensive introduction, newly written by the editor, which places the collected material in its historical and intellectual context, Urban Ecology is an essential work of reference. The collection will be particularly useful as a database allowing scattered and often fugitive material to be easily located. It will also be welcomed as a crucial tool permitting rapid access to less familiar—and sometimes overlooked—texts. For researchers, students, practitioners, and policy-makers, it is a vital one-stop research and pedagogic resource. 1. Jens Lachmund, ‘Exploring the City of Rubble: Botanical Fieldwork in Bombed Cities in Germany After World War II’, Osiris 2nd Series, 2003, 18, 234–54. 2. David A. Goode, ‘Urban Nature Conservation in Britain’, Journal of Applied Ecology, 1989, 26, 3, 859–73. 3. George W. Carey, ‘Urban Ecology, Geography, and Health Problems’, Bulletin of the New York Academy of Medicine, 1970, 46, 2, 73–87. 4. David Wachsmuth, ‘Three Ecologies: Urban Metabolism and the Society-Nature Opposition’, The Sociological Quarterly, 2012, 53, 506–23. 5. Matthew Gandy, ‘Marginalia: Aesthetics, Ecology, and Urban Wastelands’, Annals of the Association of American Geographers, 2013, 103, 6, 1301–16. 6. Christine Moskell and Shorna Broussard Allred, ‘Integrating Human and Natural Systems in Community Psychology and Ecological Model of Stewardship Behavior’, American Journal of Community Psychology, 2013, 51, 1–14. 7. Jari Niemelä, ‘Ecology and Urban Planning’, Biodiversity and Conservation, 1999, 8, 119–31. 8. Christine Susan B. Grimmond, ‘Climate of Cities’, in Ian Douglas, David Goode, Michael C. Houck, and Rusong Wang (eds.) The Routledge Handbook of Urban Ecology (Routledge, 2011), pp. 103–19. 9. Angela Gurnell, May Lee, and Catherine Souch, ‘Urban Rvers: Hydrology, Geomorphology, Ecology and Opportunities for Change’, Geography Compass, 2007, 1, 5, 1118–37. 10. Mitchell A. Pavao-Zuckerman and Loren B. Byrne, ‘Scratching the Surface and Digging Deeper: Exploring Ecological Theories in Urban Soils’, Urban Ecosystems, 2009, 12, 9–20. 11. Jean Louis Morel, Claire Chenu, and Klaus Lorenz, ‘Ecosystem Services Provided by Soils of Urban, Industrial, Traffic, Mining, and Military Areas (SUITMAs)’, Journal of Soils and Sediments, 2014. 12. Ian Douglas, ‘Urban Geomorphology and Urban Soils: Knowing the Ground You Build On and Which You Cultivate’, in Ian Douglas and Philip James, Urban Ecology: An Introduction (Routledge, 2014), pp. 101–29 (updated version). 13. M. O. Hill, D. B. Roy, and Ken Thompson, ‘Hemeroby, Urbanity and Ruderality: Bioindicators of Disturbance and Human Impact’, Journal of Applied Ecology, 2002, 39, 5, 708–20. 14. M. Kent, R. A. Stevens, and L. Zhang, ‘Urban Plant Ecology Patterns and Processes: A Case Study of the Flora of the City of Plymouth, Devon, UK’, Journal of Biogeography, 1999, 26, 6, 1281–98. 15. Petr Pyšek, Zdena Chocholoušková, Antonín Pyšek, Vojtěch Jarošík, Milan Chytrý, and Lubmír Tichý, ‘Trends in Species Diversity and Composition of Urban Vegetation over Three Decades’, Journal of Vegetation Science, 2004, 15, 6, 781–8. 16. Jenni Garden, Clive McAlpine, Ann Peterson, Darryl Jones, and Hugh Possingham, ‘Review of the Ecology of the Australian Urban Fauna: A Focus on Spatially Explicit Processes’, Austral Ecology, 2006, 31, 126–48. 17. Jameson F. Chace and John J. Walsh, ‘Urban Effects on Native Avifauna: A Review’, Landscape and Urban Planning, 2006, 74, 46–69. 18. Janet E. Nichol, Man Sing Wong, Richard Corlett, and Douglas W. Nichol, ‘Assessing Avian Habitat Fragmentation in Urban Areas of Hong Kong (Kowloon) at High Spatial Resolution Using Spectral Unmixing’, Landscape and Urban Planning, 2010, 95, 54–60. 19. Michael L. McKinney, ‘Urbanization, Biodiversity, and Conservation’, BioScience, 2002, 52, 10, 883–90. 20. P. G. Angold, J. P. Sadler, M. O. Hill, A. Pullin, S. Rushton, K. Austin, E. Small, B. Wood, R. Wadsworth, R. Sanderson, and K. Thompson, ‘Biodiversity in Urban Habitat Patches’, Science of the Total Environment, 2006, 360, 196–204. 21. J. T. Lundholm and A. Marlin, ‘Habitat Origins and Microhabitat Preferences of Urban Plant Species’, Urban Ecosystems, 2006, 9, 139–59. 22. Seth J. Wenger, Allison H. Roy, C. Rhett Jackson, Emily S. Bernhardt, Timothy L. Carter, Solange Filoso, Catherine A. Gibson, W. Cully Hession, Sujay S. Kaushal, Eugenia Martí, Judy L. Meyer, Margaret A. Palmer, Michael J. Paul, Alison H. Purcell, Alonso Ramírez, Amy D. Rosemond, Kate A. Schofield, Elizabeth B. Sudduth, and Christopher J. Walsh, ‘Twenty-six Key Research Questions in Urban Stream Ecology: An Assessment of the State of the Science’, Journal of the North American Benthological Society, 2009, 28, 4, 1080–98. 23. Robert A. Francis, ‘Wall Ecology: A Frontier for Urban Biodiversity and Ecological Engineering’, Progress in Physical Geography, 2011, 35, 43–63. 24. Jason P. Kaye, Peter M. Groffman, Nancy B. Grimm, Lawrence A. Baker, and Richard V. Pouyat, ‘A Distinct Urban Biogeochemistry?’, Trends in Ecology and Evolution, 2006, 21, 4, 192–9. 25. Sabine Barles, ‘Urban Metabolism of Paris and its Region’, Journal of Industrial Ecology, 2009, 13, 6, 898–913. 26. Cinzia Fissore , Sarah E. Hobbie, Jennifer Y. King, Joseph P. McFadden, Kristen C. Nelson, and Lawrence A. Baker, ‘The Residential Landscape: Fluxes of Elements and the Role of Household Decisions’, Urban Ecosystems, 2012, 15, 1–18. 27. Min Qiao, Yuan-Ming Zheng, and Yong-Guan Zhu, ‘Material Flow Analysis of Phosphorus Through Food Consumption in Two Megacities in Northern China’, Chemosphere, 2011, 84, 773–8. 28. Eyal Sochat, Paige S. Warren, Stanley H. Faeth, Nancy E. McIntyre, and Diane Hope, ‘From Patterns to Emerging Processes in Mechanistic Urban Ecology’, Trends in Ecology and Evolution, 2008, 21, 4, 186–91. 29. Mark A. Goddard, Andrew J. Dougill, and Tim G. Benton, ‘Scaling Up from Gardens: Biodiversity Conservation in Urban Environments’, Trends in Ecology and Evolution, 2009, 25, 2, 90–8. 30. Peter Werner, ‘The Ecology of Urban Areas and their Functions for Species Diversity’, Landscape and Ecological Engineering, 2011, 7, 231–40. 31. Ingo Kowarik, ‘On the Role of Alien Species in Urban Flora and Vegetation’, in J. M. Marzluff et al. (eds. ), Urban Ecology (Springer, 2008), pp. 321–38. 32. Mark W. Schwartz, James H. Thorne, and Joshua H. Viers, ‘Biotic Homogenization of the California Flora in Urban and Urbanizing Regions’, Biological Conservation, 2006, 127, 3, 282–91. 33. Mark J. McDonnell and Amy K. Hahs, ‘The Use of Gradient Analysis Studies in Advancing Our Understanding of the Ecology of Urbanizing Landscapes: Current Status and Future Directions’, Landscape Ecology, 2008, 23, 1143–55. 34. Myla F. J. Aronson, Frank A. La Sorte, Charles H. Nilon, Madhusudan Katti, Mark A. Goddard, Christopher A. Lepczyk, Paige S. Warren, Nicholas S. G. Williams, Sarel Cilliers, Bruce Clarkson, Cynnamon Dobbs, Rebecca Dolan, Marcus Hedblom, Stefan Klotz, Jip Louwe Kooijmans, Ingolf Kühn, Ian MacGregor-Fors, Mark McDonnell, Ulla Mörtberg, Petr Pysek, Stefan Siebert, Jessica Sushinsky, Peter Werner, and Marten Winter, ‘A Global Analysis of the Impacts of Urbanization on Bird and Plant Diversity Reveals Key Anthropogenic Drivers’, Proceedings of the Royal Society B, 2014, 281, 1–8. 35. Philippe Clergau, Solene Croci, Jukka Jokimäki, Marja-Liisa Kaisanlahti-Jokimäki, and Marco Dinetti, ‘Avifauna Homogenisation by Urbanisation: Analysis at Different European Latitudes’, Biological Conservation, 2006, 127, 336–44. 36. Jianguo Wu, ‘Urban Ecology and Sustainability the State-of-the-Science and Future Directions’, Landscape and Urban Planning, 2014, 125, 209–21. 37. Feng Li, Rusong Wang, Juergen Paulussen, and Xusheng Liu, ‘Comprehensive Concept Planning of Urban Greening Based on Ecological Principles: A Case Study in Beijing, China’, Landscape and Urban Planning, 2005, 72, 325–36. 38. Audrey Muratet, Nathalie Machon, Frédéric Jiguet, Jacques Moret, and Emmanuelle Porcher, ‘The Role of Urban Structures in the Distribution of Wasteland Flora in the Greater Paris Area, France’, Ecosystems, 2007, 10, 4, 661–71. 39. C. Barbero-Sierra, M. J. Marques, and M. Ruíz-Pérez, ‘The Case of Urban Sprawl in Spain as an Active and Irreversible Driving Force for Desertification’, Journal of Arid Environments, 2013, 90, 95–102. 40. D. E. Pataki, R. J. Alig, A. S. Fung, N. E. Golubiewski, C. A. Kennedy, E. G. McPherson, D. J. Nowak, R. V. Pouyat, and P. Romero Lankao, ‘Urban Ecosystems and the North American Carbon Cycle’, Global Change Biology, 2006, 12, 2092–102. 41. M. Agrawal, B. Singh, S. B. Agrawal, J. N. B. Bell, and Fiona Marshall, ‘The Effect of Air Pollution on Yield and Quality of Mung Bean Grown in Peri-Urban Areas of Varansi’, Water, Air, and Soil Pollution, 2006, 169, 239–54. 42. Z. Szolnoki, A Farsang, and I Puskás, ‘Cumulative Impacts of Human Activities on Urban Garden Soils: Origin and Accumulation of Metals’, Environmental Pollution, 2013, 177, 106–15. 43. E. Morillo, A. S. Romero, C. Maqueda, L. Madrid, F. Ajmone-Marsan, H. Grcman, C. M. Davidson, A. S. Hursthouse and J. Villaverde, ‘Soil Pollution by PAHs in Urban Soils: A Comparison of Three European Cities’, Journal of Environmental Monitoring, 2007, 9, 1001–8. 44. J. B. Ellis, ‘Pharmaceutical and Personal Care Products (PPCPs) in Receiving Waters’, Environmental Pollution, 2006, 144, 184–9. 45. P. M. Nyenje, J. W. Foppen, S. Uhlenbrook, R. Kulabako, and A. Muwanga, ‘Eutrophication and Nutrient Release in Urban Areas of Sub-Saharan Africa: A Review’, Science of the Total Environment, 2010, 408, 447–55. 46. Karen C. Seto, Burak Güneralp, and Lucy R. Hutyra, ‘Global Forecasts of Urban Expansion to 2030 and Direct Impacts on Biodiversity and Carbon Pools’, PNAS, 2012, 109, 40, 16083–8. 47. S. T. A. Pickett, M. L. Cadenasso, J. M. Grove, C. H. Nilon, R. V. Pouyat, W. C. Zipperer, and R. Costanza, ‘Urban Ecological Systems: Linking Terrestrial Ecological, Physical, and Socioeconomic Components of Metropolitan Areas’, Annual Reviews of Ecology and Systematics, 2001, 32, 127–57. 48. Marina Alberti and John M. Marzluff, ‘Ecological Resilience in Urban Ecosystems: Linking Urban Patterns to Human and Ecological Functions’, Urban Ecosystems, 2004, 7, 241–65. 49. Lesley Head and Pat Muir, ‘Suburban Life and the Boundaries of Nature: Resilience and Rupture in Australian Backyard Gardens’, Transactions of the Institute of British Geographers, New Series, 2006, 31, 4, 505–24. 50. Rusong Wang, Feng Li, and Juergen Paulussen, ‘Conjugate Ecopolis Planning: Balancing Ecoservice and Human Well-being in Beijing’, Annals of the New York Academy of Sciences, 2010, 1195, E131–E144. 51. S. T. A. Pickett, Brian P. McGrath, M. L. Cadenasso, and Alexander J. Felson, ‘Ecological Resilience and Resilient Cities’, Building Research & Information, 2014, 42, 2, 143–57. 52. Jennifer R. Wolch, Jason Byrne, and Joshua P. Newell, ‘Urban Green Space, Public Health, and Environmental Justice: The Challenge of Making Cities "Just Green Enough"’, Landscape and Urban Planning, 2014, 125, 234–44. 53. Catharine Ward Thompson, ‘Urban Open Space in the 21st Century’, Landscape and Urban Planning, 2002, 60, 59–72. 54. Sarah L. Bell, Cassandra Phoenix, Rebecca Lovell, and Benedict Wheeler, ‘Green Space, Health and Wellbeing: Making Space for Individual Agency’, Health & Place, 2014, 30, 287–92. 55. Anthony J. McMichael, ‘The Urban Environment and Health in a World of Increasing Globalization: Issues for Developing Countries’, Bulletin of the World Health Organization, 2000, 78, 9, 1117–26. 56. Jacquelin Burgess, Carolyn M. Harrison, and Melanie Limb, ‘People, Parks and the Urban Green: A Study of Popular Meanings and Values for Open Spaces in the City’, Urban Studies, 25, 455–73. 57. C.Y. Jim, ‘Green-space Preservation and Allocation for Sustainable Greening of Compact Cities’, Cities, 2004, 4, 311–20. 58. Anthony Bradshaw, ‘The Use of Natural Processes in Reclamation- Advantages and Difficulties’, Landscape and Urban Planning, 2000, 51, 89–100. 59. Colin D. Meurk and Helen Greenep, ‘Practical Conservation and Restoration of Herbaceous Vegetation’, Canterbury Botanical Society Journal, 2006, 37, 99–108. 60. Valentin Schaefer, ‘Alien Invasions, Ecological Restoration in Cities and the Loss of Ecological Memory’, Restoration Ecology, 2009, 17, 2, 171–6. 61. Per Bolund and Sven Hunhammer, ‘Ecosystem Services in Urban Areas’, Ecological Economics, 1999, 29, 293–301. 62. Diane E. Pataki, Margaret M. Carreiro, Jennifer Cherrier, Nancy E. Grulke, Viniece Jennings, Stephanie Pincetl, Richard V. Pouyat, Thomas H. Whitlow, and Wayne C. Zipperer, ‘Coupling Biogeochemical Cycles in Urban Environments: Ecosystem Services, Green Solutions, and Misconceptions’, Frontiers in Ecology and the Environment, 2011, 9, 27–36. 63. S. E. Gill, J. F. Handley, A. R. Ennos, and S. Pauleit, ‘Adapting Cities for Climate Change: The Role of the Green Infrastructure’, Built Environment, 2007, 33, 1, 115–33. 64. Robin Leichenko, ‘Climate Change and Urban Resilience’, Current Opinion in Environmental Sustainability, 2011, 3, 164–8. 65. Marianne Cohen, Raymond Baudoin, Milena Palibrk, Nicolas Persyn, and Catherine Rhein, ‘Urban Biodiversity and Social Inequalities in Built-up Cities: New Evidences, Next Questions. The Example of Paris, France’, Landscape and Urban Planning, 2012, 106, 277–87. 66. Henrik Ernstsson and Sverker Sörlin, ‘Weaving Protective Stories: Connective Practices to Articulate Holistic Values in the Stockholm National Urban Park’, Environment and Planning A, 2009, 41, 1460–79. 67. Nik Heynen, ‘Urban Political Ecology 1: The Urban Century’, Progress in Human Geography, 2014, 38, 598–604. 68. Sarah Whatmore and Steve Hinchliffe, ‘Living Cities: Making Space for Urban Nature’, Sounds: A Journal of Politics and Culture, 2003, 22, 37–50. 69. Paul H. Gobster and Lynne M. Westphal, ‘The Human Dimensions of Urban Greenways: Planning for Recreation and Related Experiences’, Landscape and Urban Planning, 2004, 68, 147–65. 70. Mathias Hofmann, Janneke R. Westermann, Ingo Kowarik, and Elke van der Meer, ‘Perceptions of Parks and Urban Derelict Land by Landscape Planners and Residents’, Urban Forestry & Urban Greening, 2012, 11, 303–12. 71. Robert Jones, ‘Partnerships in Action: Strategies for the Development of Voluntary Community Groups in Urban Parks’, Leisure Studies, 2002, 21, 3–4, 305–25. 72. Jari Niemalä, ‘Is there a Need for a Theory of Urban Ecology?’, Urban Ecosystems, 1999, 3, 57–65. 73. Nancy McIntyre, K. Knowles-Yánez, and Diane Hope, ‘Urban Ecology as an Interdisciplinary Field: Differences in the Use of "Urban" Between the Natural and Social Sciences’, Urban Ecosystems, 2000, 4, 5–24. 74. James P. Collins, Ann Kinzig, Nancy B. Grimm, William Fagan, Diane Hope, Jianguo Wu, and Elizabeth T. Borer, ‘A New Urban Ecology: Modeling Human Communities as Integral Parts of Ecosystems Poses Special Problems for the Development and Testing of Ecological Theory’, American Scientist, 2000, 88, 5, 416–25. 75. Maria Alberti, John M. Marzluff, Eric Shulenberger, Gordon Bradley, Clare Ryan, and Craig Zumbrunnen, ‘Integrating Humans into Ecology: Opportunities and Challenges for Studying Urban Ecosystems’, BioScience, 2003, 53, 12, 1169–79. 76. Henrik Ernstson, Sander E. van der Leeuw, Charles L. Redman, Douglas J. Meffert, George Davis, Christine Alfsen, and Thomas Elmqvist, ‘Urban Transitions: On Urban Resilience and Human-Dominated Ecosystems’, Ambio, 2010, 39, 8, 531–45. 77. Christopher G. Boone , Elizabeth Cook, Sharon J. Hall, Marcia L. Nation, Nancy B. Grimm, Carol B. Raish, Deborah M. Finch, and Abigail M. York, ‘A Comparative Gradient Approach as a Tool for Understanding and Managing Urban Ecosystems’, Urban Ecosystems, 2012, 15, 4, 795–807. 78. Jari Niemalä, ‘Ecology of Urban Green Spaces: The Way Forward in Answering Major Research Questions’, Landscape and Urban Planning, 2014, 25, 298–303. 79. Steward T.A. Pickett, William R. Burch Jr., and J. Morgan Grove, ‘Interdisciplinary Research: Maintaining the Constructive Impulse in a Culture of Criticism’, Ecosystems, 1999, 2, 4, 302–7. 80. Pippin Anderson and Thomas Elmqvist, ‘Urban Ecological and Social-Ecological Research in the City of Cape Town: Insights from an Urban Ecology City Lab’, Ecology and Society, 2012, 17, 4, 23. 81. Sarel S. Cilliers and Stefan J. Siebert, ‘Urban Ecology in Cape Town: South African Comparisons and Reflections’, Ecology and Society, 2012, 17, 3, 33. 82. Steward T. A. Pickett, Mary L. Cadenasso, J.Morgan Grove, Peter M. Groffman, Lawrence E. Band, Christopher G. Boone, William R. Burch Jr., Christine Susan B. Grimmond, John Hom, Jennifer C. Jenkins, Neely L. Law, C. H. Nilon, R.V. Pouyat, Katalin Szlavecz, Paige Warren, and Matthew A. Wilson, ‘Beyond Urban Legends: An Emerging Framework of Urban Ecology, as Illustrated by the Baltimore Ecosystem Study’, BioScience, 2008, 58, 2, 139–50. 83. Nancy B. Grimm, Stanley H. Faeth, Nancy E. Golubiewski, Charles L. Redman, Jianguo Wu, Xumei Bai, and John M. Briggs, ‘Global Change and the Ecology of Cities’, Science, 2008, 319, 756–60. 84. Marina Alberti, ‘Maintaining Ecological Integrity and Sustaining Ecosystem Function in Urban Areas’, Current Opinion in Environmental Sustainability, 2010, 2, 178–84. 85. Mark J. McDonnell and Amy K. Hahs, ‘The Future of Urban Biodiversity Research: Moving Beyond the "Low-Hanging" Fruit’, Urban Ecosystems, 2013, 16, 3, 397–409. 86. Christine E. Ramalho and Richard J. Hobbs, ‘Time for a Change: Dynamic Urban Ecology’, Trends in Ecology and Evolution, 2012, 27, 3, 179–83. 87. Karen C. Seto, Annette Reenberg, Christopher G. Boone, Michail Fragkias, Dagmar Haase, Tobias Langanke, Peter Marcotullio, Darla K. Munro, Branislkav Olah, and David Simon, ‘Urban Land Teleconnections and Sustainability’, PNAS, 2012, 109, 20, 7687–92.